This page is dedicated to posting reviews of Outer Banks Productions. We will continue to update this page as they come in. Please scroll down to read reviews that have been sent to us via email too! Thank you, customers, for taking the time to share your experiences with us we have had a great time serving you on your most special days! Just so you know, after 13 years Outer Banks Productions has stopped shooting wedding video to focus 100% on photography. We are very grateful for all of our past video customers. Thank you for entrusting us with your precious memories. If you need a referral for videography, please use our contact form and we’ll be happy to give you some suggestions! I am not sure what to say. The pictures are priceless!! Fantastic job! Some I even got a little teary-eyed! Thank you so much for capturing our memories!!! Michelle, I wanted to send you a thank you for a great ending memory for our vacation. When I suggested doing the family picture everyone was a little reluctant about doing it but decided to go along with it anyway! That night everyone said it was a lot fun and you were very easy to work with. Thank you for capturing our families memories! Can you imagine what I will say when I actually see the pictures!! I look forward to seeing the finished product!! I have used Outer Banks Productions twice now and have been extremely happy both times. The first time was in May of 2009 when I hired them to do the videography for my wedding. I live 5 hours away from OBX and planned my wedding over email and phone calls. When I viewed their website and talked with Doug, I instantly felt comfortable using their services. When you plan destination wedding, anything can go wrong, and I promise you, my wedding video was not one of those! Doug showed up on time, you barely even saw he was there, but did a phenomenal job capturing our special day. I’ve watched the video countless times and have shown it to many friends. Two years later I was back in the OBX for my 2nd wedding anniversary and wanted photos of my friends and family who were down to celebrate with us. Michelle suggested a beautiful beach at sunset to take our photos at. She had great ideas for our pictures, especially because she knew I wanted unique photos and not the same ones you see everyone else taking at the beach. Within 24 hours she posted a sneak peek on their Facebook page so I could have an idea of what I was going to be receiving! Within a couple of weeks all of my photos were up on a website for me to view. These photos now are all around my home and we have received countless compliments on them. Earlier this year I lost my home to a fire and of course the video to my wedding was in the house. I contacted Doug and Michelle to tell them what happened and to see if I could purchase another copy of my video, as that was one thing in life I couldn’t “redo”. They responded almost immediately and even sent me a complimentary copy of my DVD. This was extremely touching, as they did not have to do this! I will be back in 2012 and plan to hire them again. OBX Productions will forever have me as a client and I will recommend them to all of my friends and family. You guys did such an amazing job – can’t tell you how happy we are with all the photos! Have a great day! Michelle, thanks so much! I absolutely LOVE the pictures, you both did such a wonderful job! One of our guests is getting married on the Outer Banks May 19th and were asking about your availability. Would you be interested? First, let me tell you how much I absolutely love our photos! They are so beautiful, and it’s going to be hard to pick which ones to print! I can’t stop looking at them! Thank you so much, Michelle! Words can’t describe how pleased we are with our photos. I hope you have a wonderful Thanksgiving!! Michelle, I am crying right now I am so happy! These made my day, thank you so so so much. You do really beautiful work. I’m going to look through them again and then shoot you an email with 10 to email me. Hi Doug! Just wanted to let you know that we received our DVD’s! We haven’t watched them yet but we are very excited! Thank you so much for the extra DVDs too, we are going to give them to our families. We have had nothing but the best experience with you guys and will recommend you to anyone. Let us know if we can post anything on any websites about our experience to help you guys out. Thank you again for making our day easy and stress-free. Michelle~ Thank you so much, they are gorgeous!! You did a fantastic job!! I can’t wait to get the disk to really look at them all. You got every pose & made them all look so good. They are exactly as I had hoped & imagined! Thank you again these are pictures my girls will have forever to help them remember my Dad’s “beach”…. They’re priceless! WOW!!! That slide show is so beautiful I cried again! you did an awesome job and thank you so much for taking such amazing pictures! OH MY GOSH MICHELLE!!!!!! These are absolutely FABULOUS!!!! THANK YOU SO MUCH!!!! We may never be able to go on vacation again because I may just spend all the money I’ll ever have on pictures!!! I can’t imagine how I will ever decide which ones to get. I must say – we could not have had a better photographer – you definitely captured everything I was hoping for. Thank you – thank you – thank you. Thank you again SO much. Hi Michelle! Just wanted to let you know we received our disc and could not be happier! There are so many great shots of the kids. The pictures have the perfect blend of posed shots and natural with great expressions! I uploaded my favorites to Facebook and got an overwhelming amount of comments about how great they were. Thank you so much, I told all my friends if they are traveling to the OBX to book a session. Michelle,…I also wanted to thank you for helping to make June 9th such a special day. Scott and I were very pleased with you. You did an excellent job and I especially wanted to thank you for the prayer on the boardwalk that you said to bless our marriage. That meant so much to me! Thanks again, Michelle! You are truly a wonderful person with an amazing talent! Michele Haber – photographer – we didn’t get the pictures back yet but I can tell u how creative and open she was and how good she listened to what I wanted. She learned who we were as a couple quick and her goal was to get that into as many pics as possible. Plus she is a super nice easy going person. Her presence is determined by you- if u want her off to the side she will be, or if u want her in the thick of things directing, she will do that instead. Michelle Haber is truly gifted at her craft. We absolutely love our photos – she was able to capture traditional images as well as creative and ‘in the moment’ shots. Our wedding was in Duck and we were able to do photos at our venue, on the beach and sound shots – and she had no gripes about running all over to do so. Our wedding day was also nearly 90 degrees and she was able to make all of us look fantastic and not a sweaty mess. Additionally, Michelle arrived a few minutes early and took venue shots (which I had requested) and did not charge over-time. She was a joy to work with, very professional and made me feel extremely special on my wedding. OBP’s prices are very reasonable and completely worth every penny. I truly enjoyed working with Outer Banks Productions and feel that my money was very well spent. I received our wedding videos in the mail over the weekend, but did not have a chance to watch it until last night. OH MY GOODNESS it was AMAZING! I have no idea how you were able to capture so many precious memories from our big day, without leaving any out. The picture quality as well as the audio was fabulous. It was fantastic to see our special day unfold for us before our eyes! The great amount of work you put in to making the video perfect was evident, even the intro’s and the scene selections are awesome! I can’t even begin to thank you enough for providing us with this amazing video packed full of our favorite highlights from the best day of our lives. We can’t wait to show all of our friends and family! Also – thank you so much for giving us numerous copies for us to share with our family. I would like to let other couples who are planning a wedding in the OBX area to know just how great of a videographer you were so please let me know where would be the best place to post a review. Thank you so much once again!!!! Hi Doug and Michelle, I just wanted to let you know I received the wedding CD today and the pictures are beautiful! Thanks so much for getting it to me so I could take it with me. You can go ahead and e-mail me the web link and I’ll send it out. I look forward to getting the prints whenever you receive them and then we’ll order some larger ones Thanks again! Hi Doug and Michelle, I just wanted to thank you AGAIN for the amazing job that you did for my sister’s wedding! I can’t even tell you how nice and awesome to work with you both were. Thanks for putting up with me, my family and the heat…I know the pictures are going to be amazing! I can’t wait to see them! I’m so anxious! Again, thank you thank you thank you i would recommend you to EVERYONE getting married down there! Doug and Michelle, Thank you so much for making our day so special. You were so very helpful in setting things were they should be. Although we only met one time we feel very lucky to have met you at all. We are bragging about how wonderful you are. We wish you much success in everything you do. We wish we had more time to spend with you guys. Next time we are in North Carolina we look forward to saying hello. God Bless you and your family. Dear Doug, Thank you so much for the wonderful video. You captured our personalities perfectly. You made all of our guests feel so comfortable in front of the camera. The video tells the story of our wedding day the way we remember it. We had a great time working with you. I just wanted to say a special thank you for your kindness. You were extremely nice, accommodating, and went above and beyond with your services. It was a pleasure working with you and meeting you. Doug, We can not thank you enough for the gift you have given us with this video of our wedding. We have already watched it fifty times, sometimes we watch twice in a row. You did an amazing job, and created a memory that pictures just can’t give. You have given us our wedding.Some people just have pics, I am so glad I met you and you worked with us because it truly is something will cherish forever, and when we have a child one day they will have it, and they will see how happy we were, and how in love. The video is like a movie amazing job. I don’t even have a favorite part, because all of it is my favorite. It is amazingly romantic, and there some really funny parts like when I couldn’t get the ring on when I didn’t know I was having a sand ceremony. I can’t put into words what a great job you did, what it means to us. I’ll just give you the feedback. Everyone that has seen it has bawled. My mom cries every time she watches it. Everyone is taken back by the quality job you did, the way you did things. My sister said she had seen several wedding videos from friends & it just look liked someone had a video camera & filmed it, none looked like this. She said it was like a Hollywood movie. So to you we tip our flutes to a job well done, you did more than we ever dreamed of, and blessed us with your gift of art and your gift of compassion for others. Doug,We received the video and had a wonderful time reliving all the memories. It was really great to see some things I didn’t even know happened. It seems that you were wherever the “action” was. Don’t know how you did that, but it was great. I particularly liked the way you captured the bride and what was important to her about this event. Thank you for giving us years of enjoying a uniquely special day in our daughter’s and our new “son’s” life. A beach wedding had many challenges. The clarity of their voices during the ceremony was amazing. The views of that gorgeous day on the beach were spectacular. Dear Doug, John and I would like to thank you so very much for the wonderful job you and your wife did for our wedding vow renewal ceremony. Words can not possibly begin to express how pleased we were with the entire process from our first meeting through to the final product of the DVD’s you created for us. We never once felt like we had a camera in our face which allowed us to feel completely comfortable and because of that, I feel the finished product was a true reflection of the feelings we shared during our special event. Both you and your wife are truly gifted and your professionalism far surpassed our expectations. You have created a visual memory that we have already enjoyed viewing several times and will continue to share with our friends and families. The picture slide of our history set to music touches my heart and brings me to tears of joy every time I watch the DVD. It is something we will cherish always. If you ever need a referral, all you need to do is ask. I will be more than happy to let people know that if they use your services for any event they, will be more than pleased with their choice. Thank you for helping make our special day a lasting memory! We really appreciate you taping our wedding and putting a rush on our DVD. Thanks again for helping make our special day one we will remember forever. The DVD will remind us often of that spot on the beach where two lives were joined as one. Thank you again for all the hard work you have done to get our DVD to us, we really appreciate it. We were recently married in June and Outer Banks Productions did our videography. They were amazing! Doug and Michelle were able to work with our requests and offer several suggestions. Everything was smooth sailing on our wedding day. Doug was punctual and helped maintain a stress-free environment while still managing to catch every important shot of the big day. Outer Banks Productions was a blast to work with! They provide excellent quality videos with outstanding price packages! If I ever had to choose another production company, Outer Banks Production would be it! We have nothing but the best to speak of Outer Banks Productions. We contacted Michelle to provide photography for Kacie and I’s wedding and had no idea what incredible service we were about to get. Michelle and Doug are two of the most professional photographers we know of. They did nothing but go the extra mile every time we talked to them and even when they were at our wedding. We can’t thank you enough for capturing our special day and hope to have more opportunities to use your services in the future. We live in Ohio and my daughter’s wedding was on the beach in the Outer Banks. We had no “personal” connections there and really didn’t know what kind of service, and quality video we would get when we committed to using Outer Banks Productions. We made the perfect choice. There was always an open line of communication, and any questions were answered right away. Doug videotaped the whole ceremony without drawing attention to himself. He is a true professional at capturing the sights and sound with perfect clarity, vows, waves, music, etc. I highly recommend Outer Banks Productions! Hello again Doug & Michelle, We just wanted to let you know that we received our photographs and our DVD’s in the mail yesterday. We watched the first hour of the DVD last night and everything looks absolutely beautiful! We were so glad to see that you were able to catch our kiss even though the photographer stood in front of you! We can’t wait to show our family the DVD. It looks great and we appreciate everything very much! We hope you have a great holiday season and we will definitely be in touch again in the future. Hey Doug! I just got the video today and had to watch it! You did a beautiful job!!! Thank you so much for everything. I loved it! Matt will see it this weekend and I’m sure he will love it too. I am throwing a party in a couple weeks for people to come see it too! Hope everyone enjoys it as much as I did. Good Morning Doug and Michelle, Well I am sorry it took so long to respond to your email. We have been so busy since we got home! 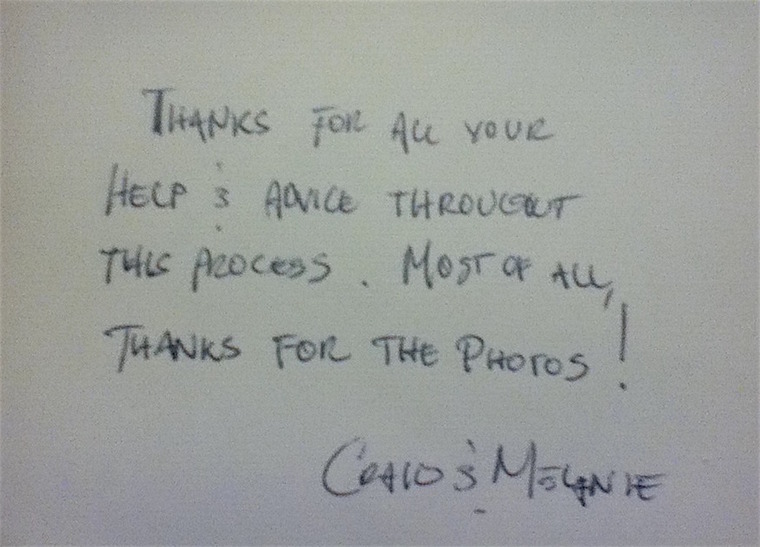 Carlos and I just wanted to thank you for the amazing job you did at our wedding. You seemed to be everywhere with your camera and we can’t wait to see our video! We are so grateful to have been blessed with such a perfect day, we couldn’t have asked for a better day in a million years! It was such a pleasure meeting you Doug, and we are also grateful for how professional yet personal you and Michelle are. We hope that you both continue to have a wonderful life together and a very successful business! No worries about the video taking up to 12 weeks. Just let us know when you send them and we will keep an eye out. Thanks again for everything and enjoy the rest of your summer. Hi Michelle & Doug, We just wanted to thank you so much for being a part of our wonderful day. From the very beginning you two were absolutely incredible. Very helpful and easy to work with. Michelle you were just wonderful the day of the wedding and you captured every picture I wanted and then some. It was such a beautiful and happy day and you have given us something that we can relive again & again. Our families also commented on what a great job you did. we could not be any happier and are so glad that we met you. Thank you so much. 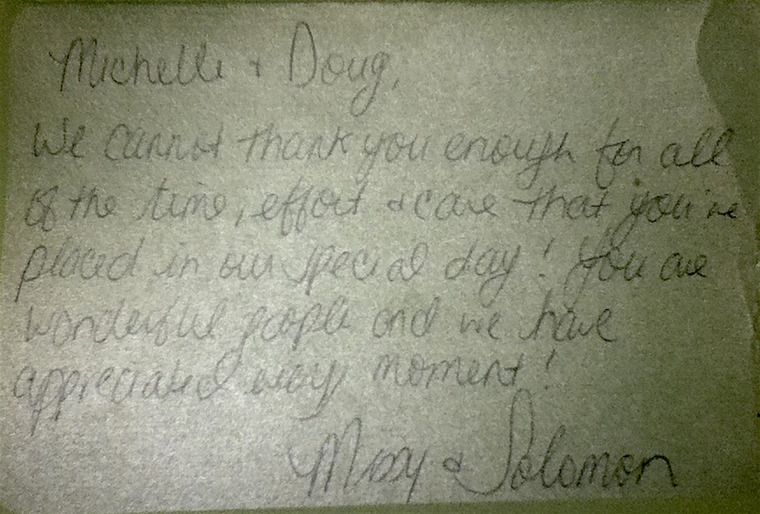 Dear Michelle and Doug, We would like to thank you for the outstanding service that we received for our wedding. You went far above our expectations and we will forever be grateful. Planning a beach wedding is never guaranteed and we learned that first hand when it rained on our wedding day. As soon as you arrived at the house you offered to meet us another day in the week to get beach pictures so that we can remember our wedding just as we wanted – on the beach! We have never heard of a photographer doing something like that. Many photographers would not even have thought twice and concluded their service at the end of the evening. You took time out of your busy schedules to meet us on another date, without us even asking you, to take the shots you knew were important to us. We truly enjoyed working with you and through your generosity and hard work; we will have beautiful memories of our wedding forever.